KANSAS CITY, Mo. (AP) — The Kansas City Chiefs had the Cardinals‘ Josh Rosen seeing red last week. As in a whole lot of red jerseys right in his face. 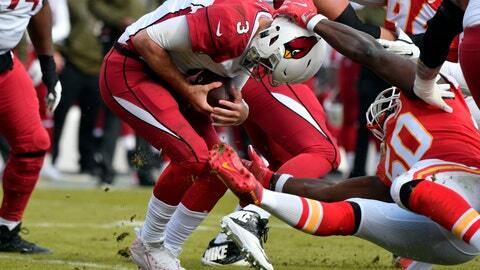 The Chiefs sacked Arizona’s rookie quarterback five times in their 26-14 victory. They hit him 13 times, forced a fumble and generally made life miserable on a cold afternoon at Arrowhead Stadium. No wonder Rosen was asked quite sympathetically how he felt after the game. Probably like he went through a trash compactor. But that performance by the Chiefs’ much-maligned defense was closer to the norm than anything special this season. They already have 31 sacks to match their total from all last season, even though their highest-paid player and top pass rusher, Justin Houston, has missed four games to injury. That puts the Chiefs in a tie with Pittsburgh, Minnesota and Green Bay for the NFL lead. The Chiefs struggled last season to pressure the quarterback, and there was little reason to think that would change this season. They brought back most of the same cast, though Tamba Hali stepped into retirement after an unproductive year and rookie Breeland Speaks took his spot, and defensive coordinator Bob Sutton was retained after coming under intense scrutiny. But the Chiefs did make a couple of other important changes to the coaching staff, replacing their longtime linebackers coach Gary Gibbs with Mark DeLeone and Mike Smith. DeLeon handles the inside guys and Smith handles the outside linebackers, and by splitting up the duties both of them are able to give more one-on-one time to their players’ skill-specific needs. The progress is easiest to see in Dee Ford, the Chiefs’ former first-round pick who had battled injuries and inconsistency his first four seasons. The Chiefs picked up his fifth-year option — that was no guarantee — and he has flourished when it comes to getting after the quarterback. He has nine sacks to trail only the Rams’ Aaron Donald — who will be on the field against Kansas City on Monday night — and the Vikings’ Danielle Hunter. His total is also tied with J.J. Watt, Myles Garrett and Von Miller, leaving the always-upbeat Ford in some pretty select company. “I don’t think anyone in this league can block him coming off that edge one-on-one,” said Chiefs running back Kareem Hunt, who has tried several times with little success in practice. Ford isn’t just getting sacks, though. He has also hit the quarterback an astounding 20 times and has four strip-sacks to give the Chiefs the ball in some crucial situations. The Chiefs’ Chris Jones has seven sacks, including one in six straight games, and fellow defensive tackle Allen Bailey has a career-best five. Houston only has three sacks because of injuries, but he was back to near-100 percent against the Cardinals, picking off Rosen at the line of scrimmage. Indeed, the Chiefs’ aggressive pass rush has been doubly important after their secondary had to go through some growing pains. Kansas City traded away top cornerback Marcus Peters, star safety Eric Berry has been out all season with a heel injury, and fellow safety Daniel Sorensen only recently returned to the field after breaking his leg in training camp. In other words, it has been a mishmash of next-man-up lineups in the defensive backfield, putting even more pressure on the guys up front to help them out. “We say every week that we’ve got to be willing to win the game however it presents itself, whether it’s on offense, defense or special teams,” Ford said. “Defense actually met this week and that’s one thing we spoke on: Let’s take it to another level. We can’t really rely, especially late in the season, off of a lot of points from our offense.